Holiday Inn Club Vacations Holiday Hills in Branson, Missouri - Buy a 7 Night Stay in a Studio, 1 or 2 Bedroom Suite! Enjoy 7 Nights in a Studio, 1 or 2 Bedroom Suite at the Holiday Inn Club Vacations Holiday Hills in Branson, Missouri! A championship-caliber golf course and Pro Shop, tennis and basketball courts, along with outdoor swimming pools are just a few of the amenities you can enjoy at Holiday Hills Resort. You can also enjoy the casual setting of the on-site restaurant which also offers a full-service bar and an environment where you can come relax after a good game of golf or a full day of sightseeing, biking or hiking. 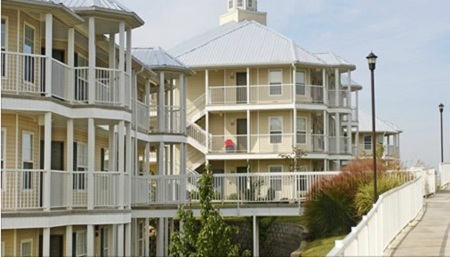 Surrounded by the majestic Ozark Mountains and minutes from Lake Taneycomo, Holiday Hills Resort offers premier opportunities for unlimited vacation enjoyment. Ride the Ducks and tour the sites of both Branson and Lake Taneycomo. Spend the day at Silver Dollar City Theme Park. Shop and dine at Branson Landing,a premiere shopping, dining and entertainment destination located in Historic Downtown Branson on Lake Taneycomo. In addition, Branson is home to 49 magnificent live performance theaters, three pristine lakes, and 10 championship golf courses. Spacious, air-conditioned accommodations are perfect for vacationing families or couples enjoying a getaway. All accommodations have a private balcony or patio and come with kitchen facilities that include a microwave, and for added comfort and convenience, some units also feature dishwashers and washer/dryers.